Students fill out the tardy slip with their name, the date, and their reason for being tardy. Then they choose yes or no in response to the question, Do you need help so it doesn't happen again? Then they can drop it into a box or hand it to the teacher. 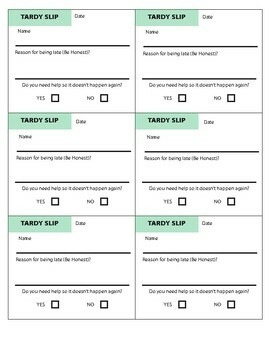 If your school issues printed tardy slips, they can staple it to the tardy slip. This way you and the student have a record and the student has to go through a formal process of explaining themselves. They are also in the student's handwriting which can be useful if tardiness becomes a problem that needs to be discussed at a parent-teacher conference.